In India, We have seen the Pay Per model very successful in various fields of Business but yet to be introduce in Education in effective way. Country where Billion plus population lives and majority are from middle and lower middle income group need to save money to full fill all the requirement of the family. Things are getting expensive day by day and people look various ways and means to save money. Thus, like from the field of transportation where many apps came to facilitate the transportation by Pay per ride model are quite successful model as it helps the people to save the money along with convenient journey. Pay Per use model is also successful in various other model of business as well. However yet billions of transaction is happening in tuition/coaching industry where parents pay the tuition/coaching fees as monthly/quarterly or annually and yet they cannot save money even if their kids has not attended the class. These Tuition and coaching as well as Home tutors charge the parents and students on per class basis but if they do not attend the class then they don’t compensate or refund the money and hence, in way parents get cheated as they have already paid the money for the session and there is hardly any refund of fees. No government policy is yet framed to stop such menace and such business is running freely in India. Parents and Students till now don’t had the option to pay these or all tuition, coaching and home tutors as Pay per Class basis and hence can save money or get value for money. To safe guard the interest of the people and their hard earned money, Tuikart has launched the Pay Per Class or Pay Per Session model in Tuition and Coaching Industry. Now Parents can avail the service almost for free and pay tuition, coaching and home tutor fee as Pay Per Class basis. Parents and students pay their fees for number of class like 12 class or 16 classes or any session time for x amount per month and if they miss any class or more class then there is no refund and therefore they get cheated and they don’t release the same. Now parents and student can book class with these providers based on their need and requirement with the help of Tuikart. They all can book class for one day, 1 week or 1 month, 1 year or for any number of days based on the time table for the service providers and pay Per class basis only. 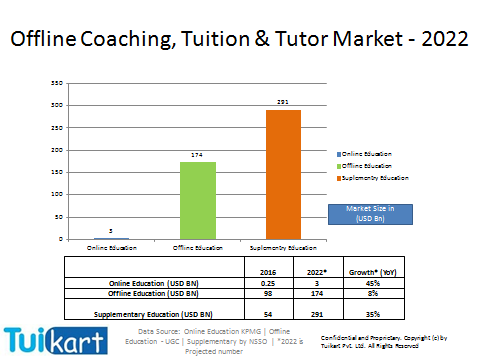 As per below graph, the increase in tuition and coaching industry will be very sharp and would reach to …. 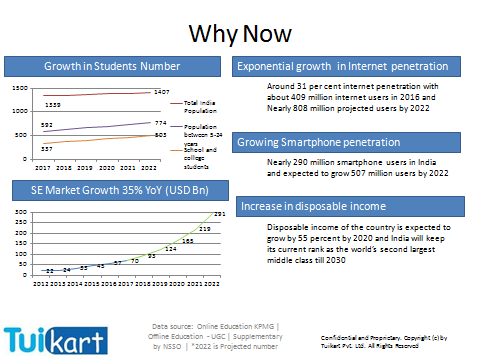 by 2022 at the pace of 35% annual growth in comparison to other sectors in education. Online is latest phenomenon in the education sector which would still be very little in comparison to the traditional face to face tuition/coaching learning. People in India still prefer to visit the center / place to take class personally with teacher. Thus, the growth of Online learning will be very less in comparison to traditional learning but it is increasing very fast due to many players in this line. Because of various factors like to complete their syllabus, get higher marks, preparing for higher studies or for job student join these academy. Thus it shows the lack of infrastructure and service in education system in India but factors effecting to increase in awareness now are many. Thus, the students taking private tuition and coaching will keep on rising due to various factors as mentioned below. By 2022 there will be massive increase in number of students taking tuition and coaching because of above reasons and therefore, we may see the increase of number from 337 Millions to 503 Million approx. in five years only that are potential for taking tuition or coaching by 2022. Therefore, Pay Per class and pay per session become very important in coming days as it will save huge amount of money and help to channelise the money for better usage. It also help people to use it more efficiently rather than just like blocking the capital money on every 1st day of month. Tuition and coaching industry in India is multi Billion Dollar industry and huge cash transaction is happening and since in absence of proper guidelines or policy they are mushrooming like anything. They also indulge in tax theft by not showing proper earning and students for the sake of good future get into trap and pay them in cash also. It helps to safe guard money. In case of withdraw from tuition/coaching money is safe. low and middle income parents now can avail the expensive coaching or tuition. Pay per class specially in examination time help students to clarify specific chapter from any subjects in few classes only or based of requirement without booking for whole month. With Tuikart you may help to bring them under tax and hence, they will charge but won’t do fraud and many more and can be find here. Many tuition and coaching center won’t accept this process as it will be revenue loss to them. Not many players in India are providing this service in education industry. Tuition and coaching are not license based service hence anyone and at any place can opened hence tie-up with them will be huge problem from Pay Per Class platform providers. Convince of methodology is very new and acceptance is challenge. Because of proposition, easy acceptance in people. People aware of Pay Per Use/Pay per ride model hence easy usability. People can save money etc etc.